I thoroughly enjoyed The Apparition Trail. Lisa Smedman has created a wonder story of adventure, with Corporal Marmaduke Grayburn of the North West Mounted Police leading the reader through 1884 Canada. This is not the Canada of our history books. How could it be? In this slice of alternate history there are perpetual motion machines, magic, and the moon’s rotation has even been changed. The Apparition Trail is told from Corporal Marmaduke Grayburn’s perspective. It is done in such an easy flowing manner that I could almost believe that he truly existed, and that in some fluke of alternate dimensions, or cracks in time space, Lisa Smedman actually met the man and got his story. If you are looking for an author who will do great things in the future, you might want to keep an eye on Lisa Smedman. 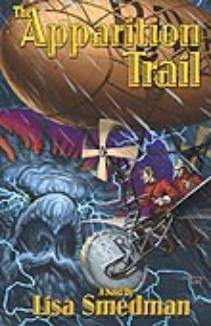 I am a fan of alternate histories, but even if I wasn’t I would have enjoyed The Apparition Trail.